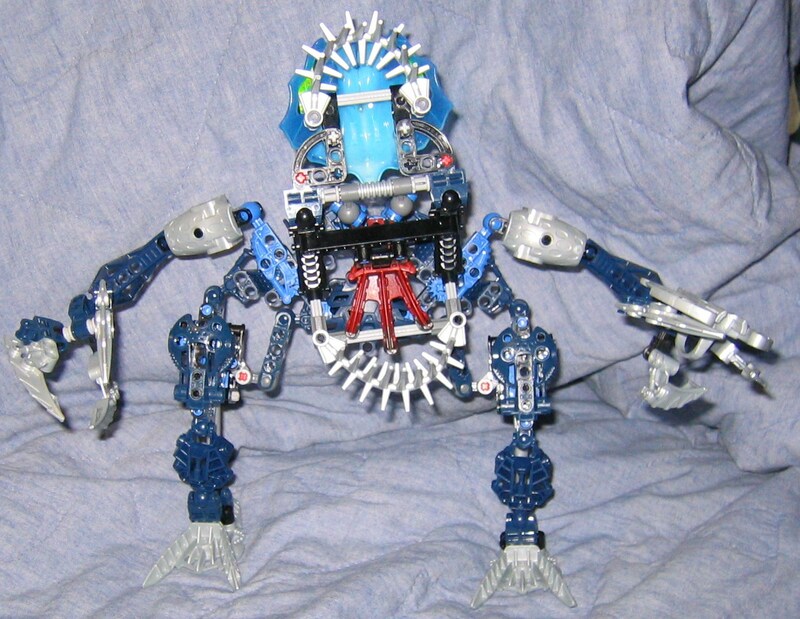 Gadunka is a very different character compared to the other titan/warrior sets in his group, and uses a non-standard style of construction. He comes with a variety of good parts at about the same price of two Toa Mahri. I think he's a bit hollow for the price and I'd rather have a more bulky version of Gadunka since his arms are skinny and his torso lacks some armor to cover the gaps, even if it meant bumping up the price a bit. I think I would recommend him, but not as much as Hydraxon who costs the same. 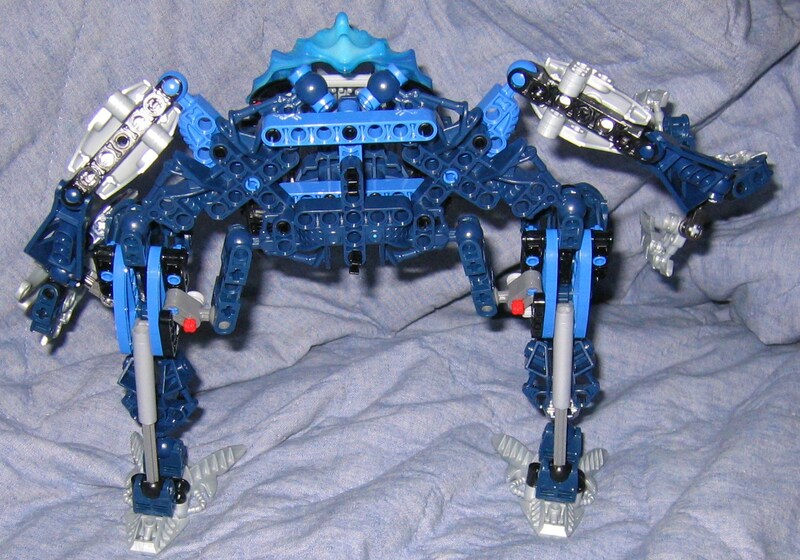 If you have the money for all thee titans I would put him last on the list unless you specifically like him more than Hydraxon and the Maxilos and Spinax set. 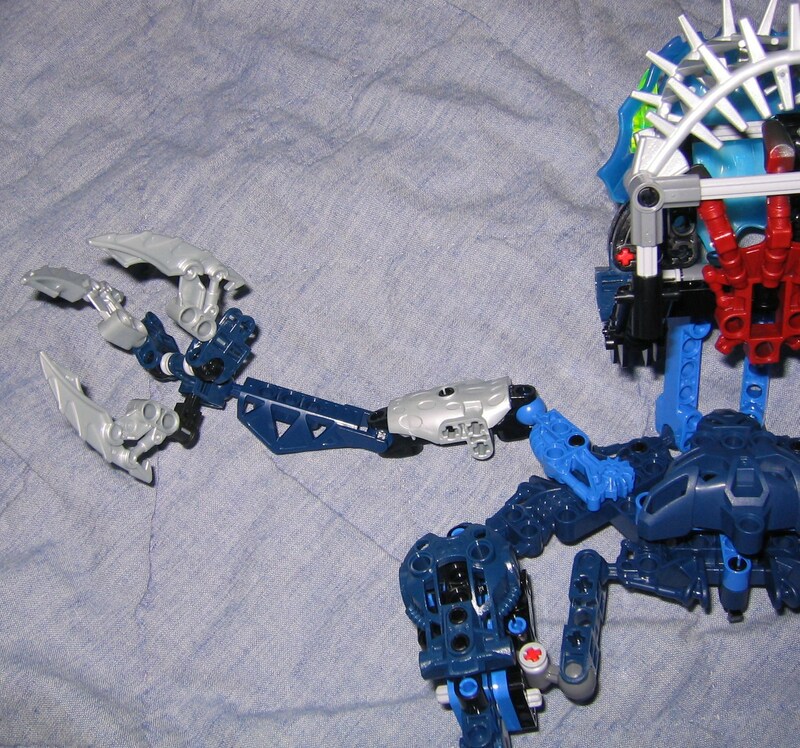 Gadunka's unique build and leg construction is interesting enough to actually build him first if your just grabbing him for the parts, and stands out when on display. 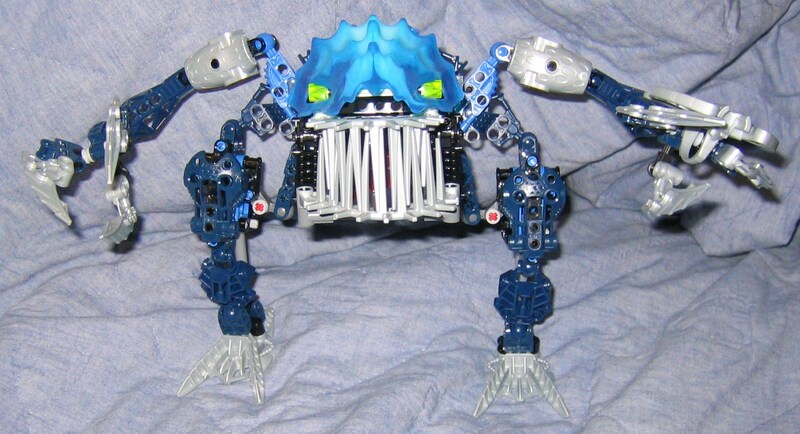 He has quite a bit of articulation with a pair of jaws that opens larger than the majority of other creatures with articulated mouths. 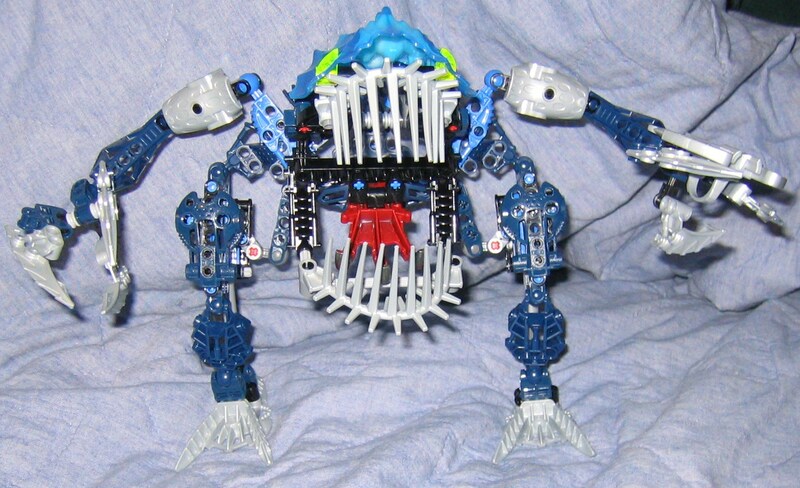 I think the only set that rivals Gadunka's jaws is the alternate model for the Bahrag set. With his articulation, design, and unique construction he is also a pretty fun set to play with even though I don?t find him to be the best of the titans for this year. It?s hard to figure out what number of articulated points he has since his upper legs and doubled neck might count as one point of articulation. He doesn?t have the greatest amount of movement but what he does have is good for him. I only disagree with how the arms have switched over to bending the arm backwards at the elbow for the sake of looking better at the loss of range of motion. 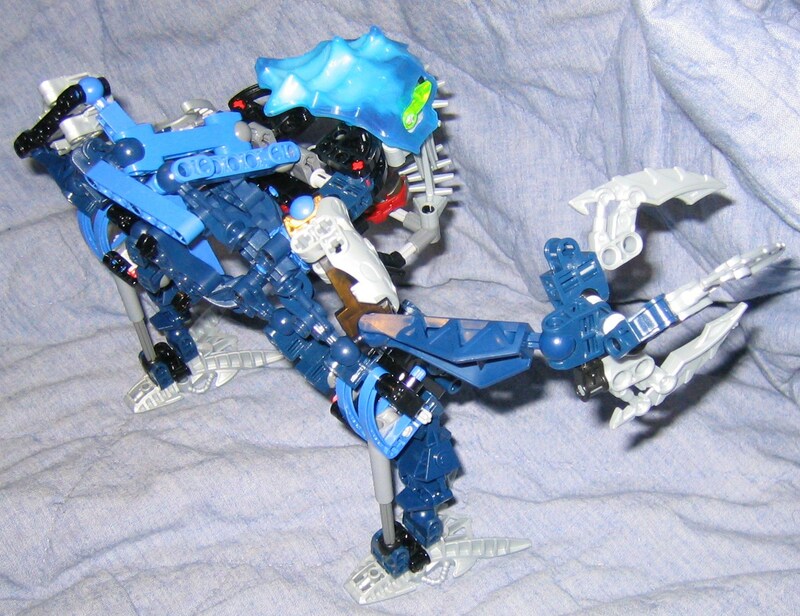 The bladed fingers are one of his stand-out features, and two of the claws independently move while the middle one is immobile and part of the base for the two articulated claws. The independent claws rest on the new type of socket joint which despite my fears has so far stayed onto the hand without any trouble and has yet to pop off. 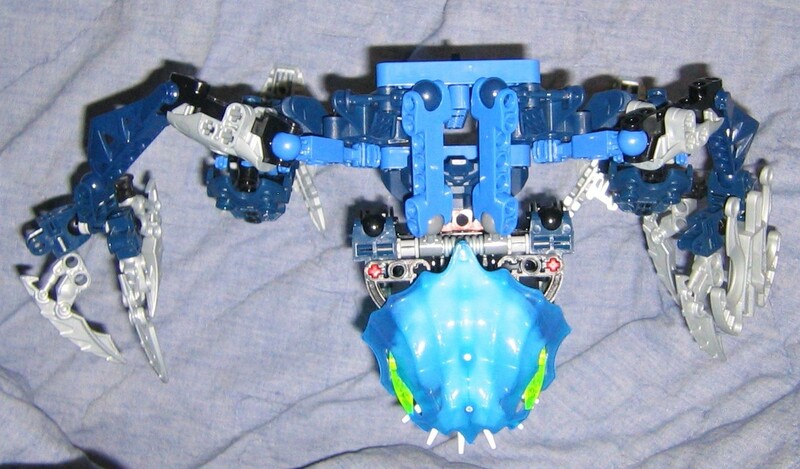 In total he has six of the newer technic ball, compared to the other titans who usually have two, or Maxilos and Spinax, who has four but is about $30.00 USD. 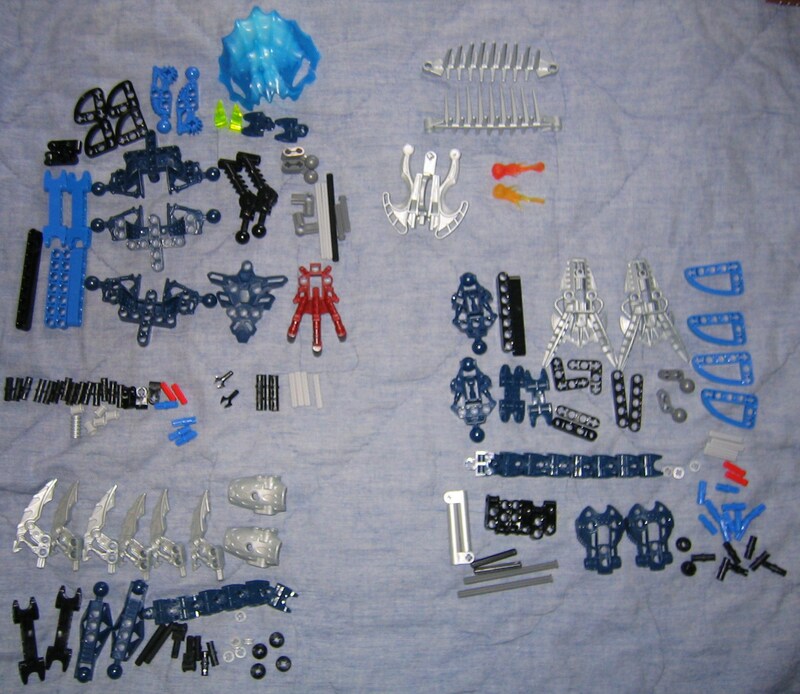 So on top of having a variety of great parts, for the price he has the most of this part which is quite valued amongst people who build their own creations. As I said before it?s a bit hollow but interesting, the legs and head in particular. 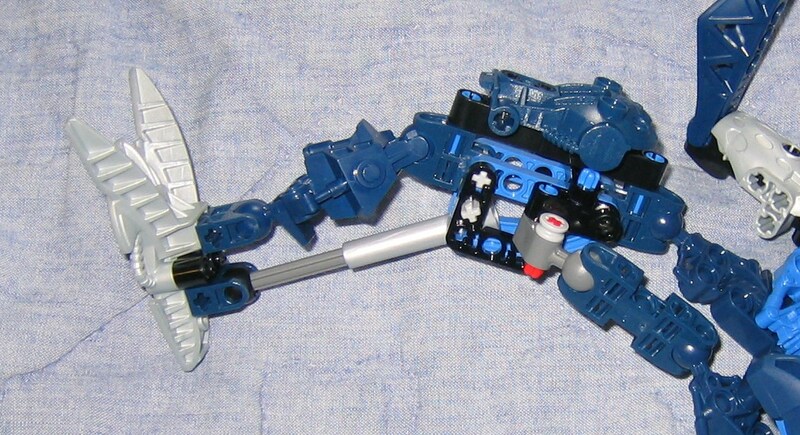 He has doubled legs with a hordika neck attached to a friction peg to create a secondary hinge which allows his legs to move side to idea as well as forward and backwards. At first I didn?t like the blue friction peg there because I thought the hinge would pop out too easily, but a black ninety degree bar pops in at a later step to hold the friction peg where it is. If you've noticed the red connector in the hordika neck leg joint, it looks odd but I think it keeps it from bending inward rather than outward when pulling the leg closer to the body. Without that it could cause the leg to break or jam. Looking at the foot where the two sockets are, normally we would see some parts to connect the two sockets together and prevent them from popping out of place. Instead a simplified construction is in place, a simple black peg holds a short bar in between to block the space off that the sockets would usually slide out into. This isn?t as sturdy as the older method but it looks better without all the extra parts. 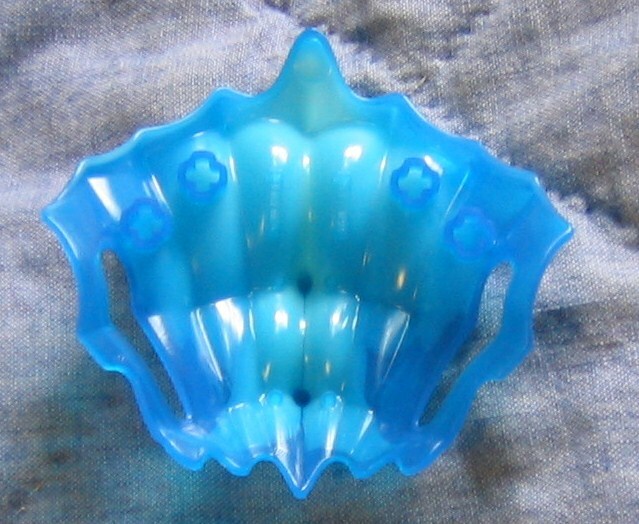 His head and jaws are the largest portion of the set and the most hollow. 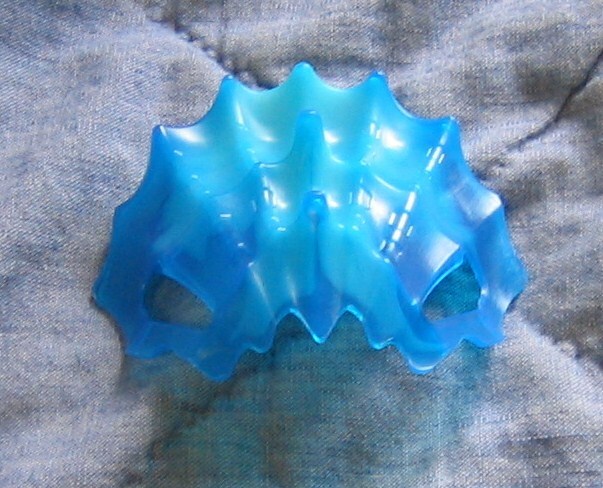 The teeth are simply two pairs of flexible spines bent across at two slightly different angled arches. 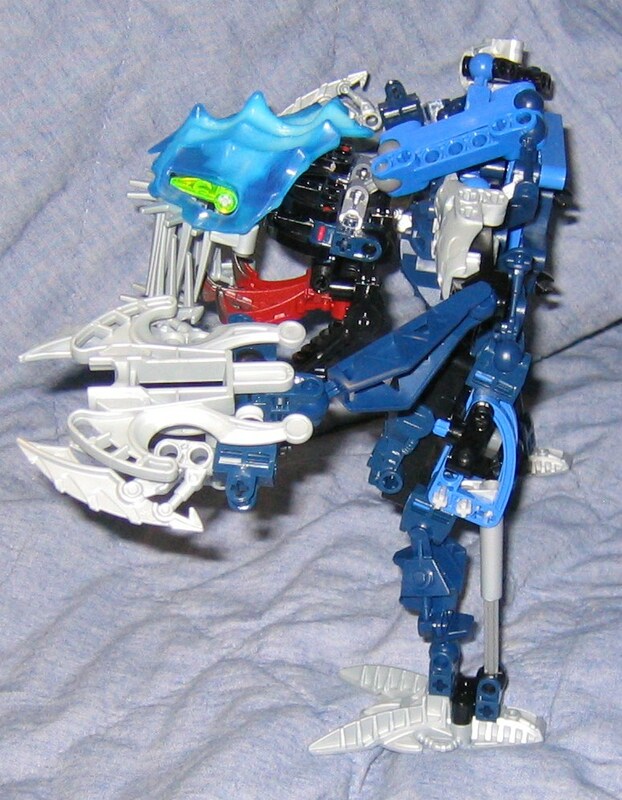 A pair of arms from the original Toa Onua set act as the jaw itself while a bar holds a red piraka foot on a hinge to act as a throat ant tongue. The bar here with the axles and plus rods reinforce the lower jaw and keep if from tilting horizontally at odd angles. 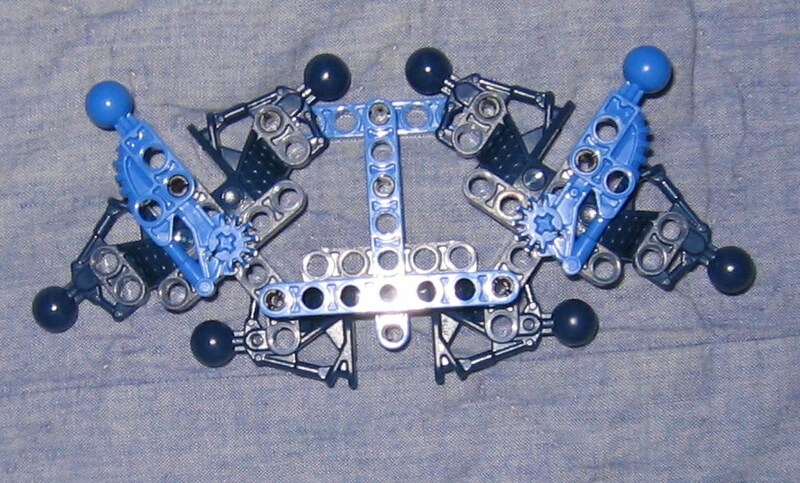 The skull holds the top row of teeth in place while some elbow bars and technic parts create the section that the neck and lower jaw attach to and plugs into the back pair of plus rod slots to hold the glow in the dark skull on. The green eyes actually hang loose but the ridges of the eye holes limit the eyes from swinging out of place. Gadunka is a bit of a challenge to get standing, I've found the best method is to have the majority of his torso tilt backwards or forwards, with his head standing about even above his feet rather than forward of them depending on the angle. I think the more natural position is for his torso to bend forward, this lets his massive head hang downward where the majority of the weight best holds it forward of the torso giving him ample room to open and close his jaws, and the most range for his head to tilt up and down. With the torso bending backwards the head rests on his belly, and you have to lift his head up first before you can open his jaws up. You would also find a smaller range of motion that he can actually stand on since most of his wait goes to his heals when it should be going onto his front toes. Thanks to Swert for spellchecking it this time around while Im working on getting Microsoft Word to work, and also to Carbunicle who pointed out some errors me, Swert, and the spellchecker program missed....I think I've got everything now but who knows.